For other uses, see Ebony (disambiguation). Ebony is a dense black hardwood, most commonly yielded by several different species in the genus Diospyros, which also contains the persimmons. Ebony is dense enough to sink in water. It is finely-textured and has a very smooth finish when polished, making it valuable as an ornamental wood. The word ebony comes from the Ancient Egyptian hbny, through the Ancient Greek ἔβενος (ébenos), into Latin and Middle English. Species of ebony include Diospyros ebenum (Ceylon ebony), native to southern India and Sri Lanka; Diospyros crassiflora (Gabon ebony), native to western Africa; and Diospyros celebica (Makassar ebony), native to Indonesia and prized for its luxuriant, multi-colored wood grain. Mauritius ebony, Diospyros tessellaria, was largely exploited by the Dutch in the 17th century. Some species in the genus Diospyros yield an ebony with similar physical properties, but striped rather than evenly black (Diospyros ebenum). Ebony has a long history of use, with carved pieces having been found in Ancient Egyptian tombs. By the end of the 16th century, fine cabinets for the luxury trade were made of ebony in Antwerp. The wood's dense hardness lent itself to refined moldings framing finely detailed pictorial panels with carving in very low relief (bas-relief), usually of allegorical subjects, or with scenes taken from classical or Christian history. Within a short time, such cabinets were also being made in Paris, where their makers became known as ébénistes, which remains the French term for a cabinetmaker. Modern uses are largely restricted to small items, such as crucifixes, and musical instrument parts, including black piano and harpsichord keys, violin, viola, mandolin, guitar, double bass, and cello fingerboards, tailpieces, pegs, chinrests, and bow frogs. 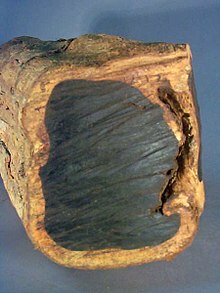 Many plectra, or guitar picks, are made from this black wood. Traditionally, the black pieces in chess sets were made from ebony, with rare boxwood or ivory being used for the white pieces. Modern East Midlands-style lace-making bobbins, also being small, are often made of ebony and look particularly decorative when bound with brass or silver wire. Due to its strength, many handgun grips and rifle fore-end tips are made of ebony, as are the butts of pool cues. As a result of unsustainable harvesting, many species yielding ebony are now considered threatened. Africa in particular has had most of its indigenous ebony cut down illegally. In Sri Lanka, ebony is a protected species and harvesting and sale of ebony is illegal and punishable by imprisonment. In 2012, the Gibson Guitar company was raided by the US Fish and Wildlife Service for violations of the Lacey Act of 1900, which prohibits the importation of threatened woods and other materials. Pete Lowry, an ebony and rosewood expert at the Missouri Botanical Garden, calls the Madagascar wood trade the "equivalent of Africa's blood diamonds". Ebony, when ground into fine dust (for example, during sawing), results in a flammable and toxic powder which can float about in air for several days. Due to the high toxicity of ebony in powdered form, its use in construction work requires government certification in several South Asian countries. ^ "Gaboon Ebony". www.wood-database.com/ Lumber Identification (Hardwoods). The Wood Database. Retrieved 2016-12-11. ^ D.M., Dixon, (19 February 1961). "The ebony trade of ancient Egypt". discovery.ucl.ac.uk. ^ "Gov't says wood is illegal if U.S. workers produce it". Gibson Guitar Company. Retrieved 6 September 2016. ^ Alter, Lloyd (August 7, 2012). "Gibson Guitar Company Admits To Using Illegal Rainforest Woods, Settles With Government". treehugger.com. Look up ebony in Wiktionary, the free dictionary. Wikimedia Commons has media related to Ebony.